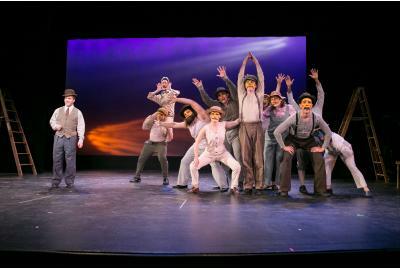 Production photo from Faction of Fools' production of Our Town by Thornton Wilder. Pictured: Matthew Pauli and the cast. Presented at Gallaudet University's Elstad Auditorium, May 28 - June 21, 2015. Photo by C. Stanley Photography. 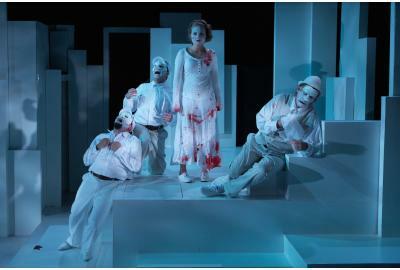 Nello DeBlasio, Matthew Pauli, Miranda Medugno, and Toby Mulford in Titus Andronicus. Directed by Matthew R. Wilson, set by Ethan Sinnott, lighting by Michael Barnett, costumes by Denise Umland, masks by Aaron Cromie, sound & music by Thomas Sowers, props by Kristen Pilgrim, blood effects by Casey Kaleba. Photo by Teresa Wood. 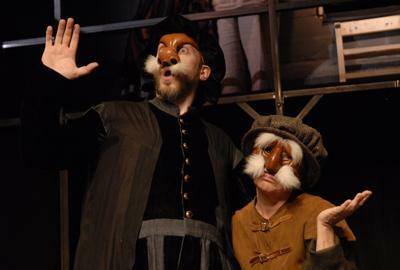 Toby Mulford, Jack Novak, and Hannah Sweet in Pinocchio! 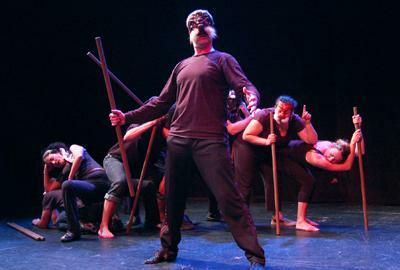 Co-produced by Faction of Fools and NextStop Family, March 8 – 30, 2014. Costumes by Lynly Saunders, masks by Tara Cariaso at Waxing Moon Masks, set by Daniel Flint, music by Jesse Terrill, puppets and properties by Dan Mori. Photo by Traci J. Brooks. 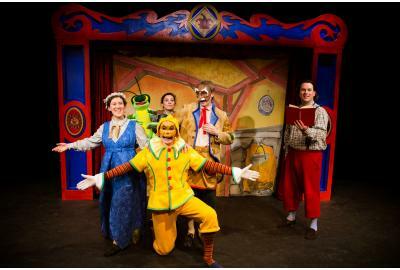 Hannah Sweet, Alani Kravitz, Jack Novak, Toby Mulford, and Justin Purvis in Pinocchio! Co-produced by Faction of Fools and NextStop Family, March 8 – 30, 2014. Costumes by Lynly Saunders, masks by Tara Cariaso at Waxing Moon Masks, set by Daniel Flint, music by Jesse Terrill, puppets and properties by Dan Mori. Photo by Traci J. Brooks Studios. Paul Reisman in A Commedia Christmas Carol. Costumes by Denise Umland, lighting by Andrew Griffin, set by Ethan Sinnott, music by Jesse Terrill, sound by Thomas Sowers, and masks by Tara Cariaso at Waxing Moon Masks. 2012. Photo by Second Glance Photography. 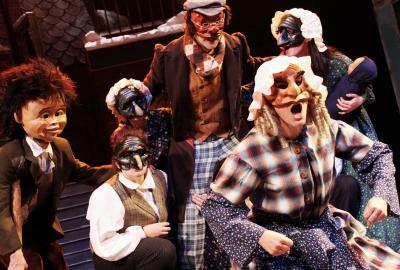 Michael Sprouse, Jessica Willoughby, Marianna Devenow, Joel David Santner, Julie Garner, and Sandra Mae Frank in A Commedia Christmas Carol. Costumes by Denise Umland, lighting by Andrew Griffin, set by Ethan Sinnott, music by Jesse Terrill, sound by Thomas Sowers, and masks by Tara Cariaso at Waxing Moon Masks. 2012. Photo by Second Glance Photography. 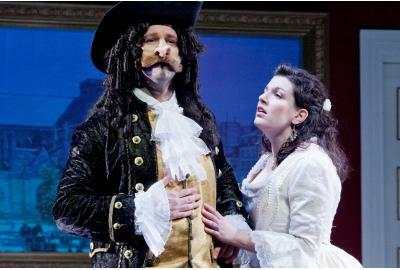 Sun King Davis and Bess Kaye in Moliere's Don Juan. Costumes by Denise Umland, lighting and set by Klyph Stanford, sound and music by Neil McFadden, and masks by Aaron Cromie. 2013. Photo by C Stanley Photography. The cast of The Lady Becomes Him. Costumes by Lynly Saunders, lighting by Chris Holland, set by Daniel Flint, masks by Aaron Cromie, and music by Jesse Terrill. 2013. Photo by Second Glance Photography. Rachel Spicknall Mulford and Amelia Hensley in The Lady Becomes Him. Costumes by Lynly Saunders, lighting by Chris Holland, set by Daniel Flint, music by Jesse Terrill, and masks by Aaron Cromie. 2013. Photo by Second Glance Photography. 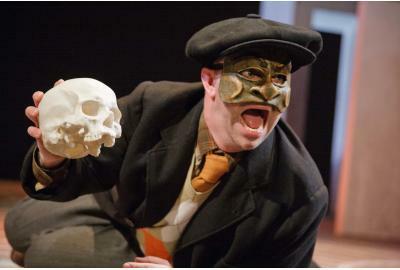 Matthew R. Wilson in Hamlecchino: Clown Prince of Denmark. Costumes by Denise Umland, lighting by Andrew Griffin, set by Ethan Sinnott, music by Jesse Terrill, sound by Mehdi Rauofi, and masks by Aaron Cromie. 2012. Photo by C. Stanley Photography. 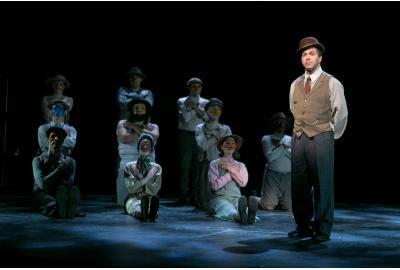 Billy Finn, John V. Bellomo, Emma Crane Jaster, Eva Wilhelm, Matthew R. Wilson, and Rachel Spicknall Mulford in Hamlecchino: Clown Prince of Denmark. Costumes by Denise Umland, lighting by Andrew Griffin, set by Ethan Sinnott, music by Jesse Terrill, sound by Mehdi Rauofi, and masks by Aaron Cromie. 2012. Photo by C. Stanley Photography. Matthew R. Wilson and David Gaines in Hamlecchino: Clown Prince of Denmark. Costumes by Denise Umland, lighting by Andrew Griffin, set by Ethan Sinnott, music by Jesse Terrill, sound by Mehdi Rauofi, and masks by Aaron Cromie. 2012. Photo by C. Stanley Photography. Paul Reisman, Toby Mulford, Eva Wilhelm, and Drew Kopas in Romeo and Juliet. Costumes by Lynly Saunders, lighting by Sarah Tunderman, set by Daniel Flint, music by Jesse Terrill, sound by Thomas Sowers, and masks by Aaron Cromie. 2012. Photo by ClintonBPhotography. Gwen Grastorf, Drew Kopas, and Toby Mulford in Romeo and Juliet. Costumes by Lynly Saunders, lighting by Sarah Tunderman, set by Daniel Flint, music by Jesse Terrill, sound by Thomas Sowers, and masks by Aaron Cromie. 2012. Photo by ClintonBPhotography. The cast of Romeo and Juliet. Costumes by Lynly Saunders, lighting by Sarah Tunderman, set by Daniel Flint, music by Jesse Terrill, sound by Thomas Sowers, and masks by Aaron Cromie. 2012. Photo by Clinton B Photography. 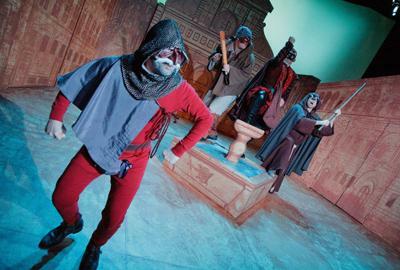 Jesse Terrill, Charlie Ainsworth, Matthew R. Wilson, and Daniel Flint in Machiavelli's The Mandrake. 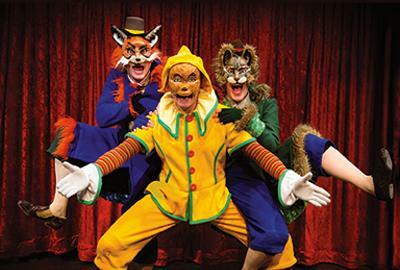 Costumes by Lynly Saunders, lighting by AJ Guben, set by Daniel Flint, and masks by Aaron Cromie. 2011. Photo by C. Stanley Photography. 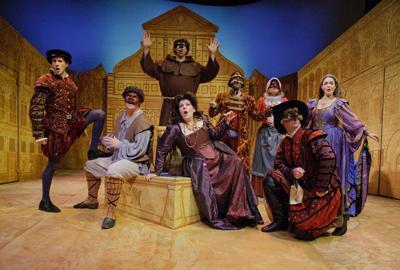 The cast of Machiavelli's The Mandrake. Costumes by Lynly Saunders, lighting by AJ Guben, set by Daniel Flint, and masks by Aaron Cromie. 2011. Photo by C. Stanley Photography. The 1st Annual Fool for All: Tales of Love and Sausages, part of the Capital Fringe Festival. Masks by Antonio Fava. 2010. Photo by Virginia Vogt. Toby Mulford and Annetta Dexter Sawyer in The House With Two Doors. Costumes by Lynly Saunders, lighting by Zoia Wiseman, masks by Antonio Fava. 2010. Photo by Yuriy Zahvoyskyy. The cast of The House With Two Doors. Costumes by Lynly Saunders, lighting by Zoia Wiseman, masks by Antonio Fava. 2010. Photo by Yuriy Zahvoyskyy. 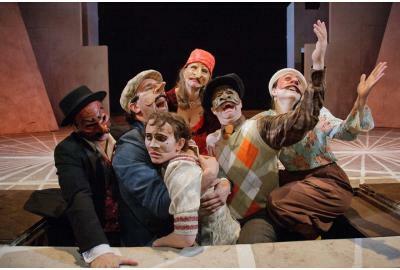 DC’s Commedia dell'Arte theatre company. 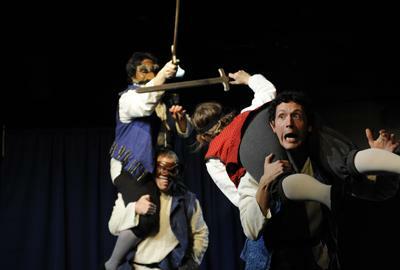 In our performances, actor training, international initiatives, and educational outreach, Commedia dell'Arte is theatre at its best: physical discipline, spontaneous imagination, collaborative energy, and joyous wonder. Recipient of the 2012 John Aniello Award for Outstanding Emerging Theatre Company.